Hayama, H., Kaneda, M., Tabata, M., 2006. 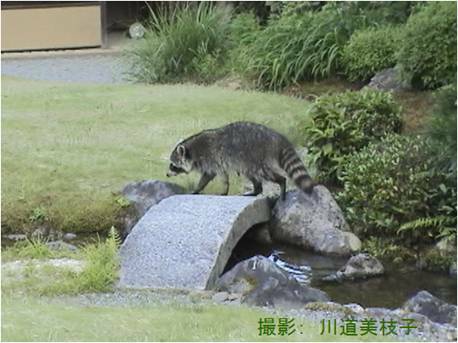 Rapid range expansion of the feral raccoon (Procyon lotor) in Kanagawa Prefecture, Japan, and its impact on native organisms. In Koike, F., Clout, M. N., Kawamichi, M., De Poorter, M. and Iwatsuki, K. (eds). Assessment and Control of Biological Invasion Risks. Shoukadoh Book Sellers, Kyoto, Japan and IUCN, Gland, Switzerland, pp 196-199. Koike, F. 2006. Prediction of range expansion and optimum strategy for spatial control of feral raccoon using a metapopulation model. In Koike, F., Clout, M. N., Kawamichi, M., De Poorter, M. and Iwatsuki, K. (eds). Assessment and control of biological invasion risks. Shoukadoh Book Sellers, Kyoto, Japan and IUCN, Gland, Switzerland, pp 148-156.